Have you ever had a chance to see how athletes train? The coach is constantly watching the stopwatch while the athletes make multiple runs. The stopwatch is used to check the performance of students as they perform the run. 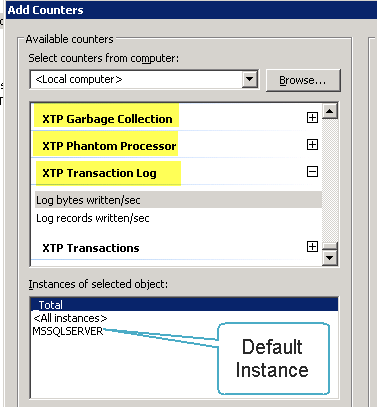 In a similar way, SQL Server In-Memory OLTP performance can be monitored using Performance Monitor (PerfMon). 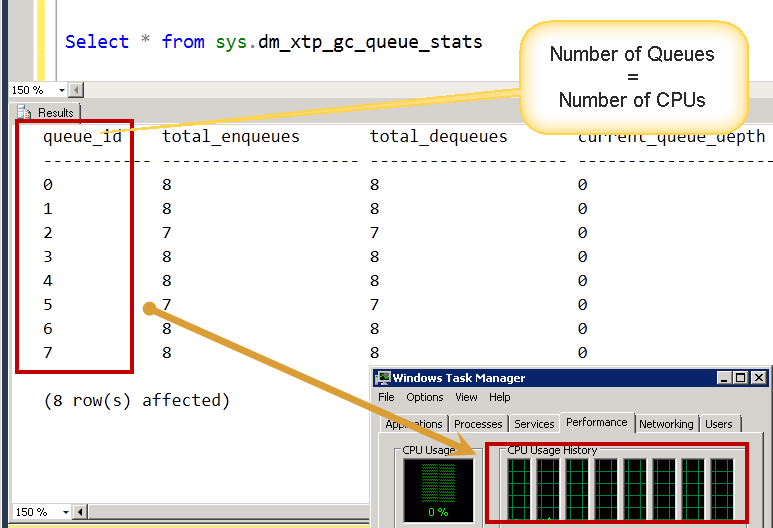 In this blog we will discuss about some of the performance counters we can use to monitor various parameters of In-Memory OLTP. 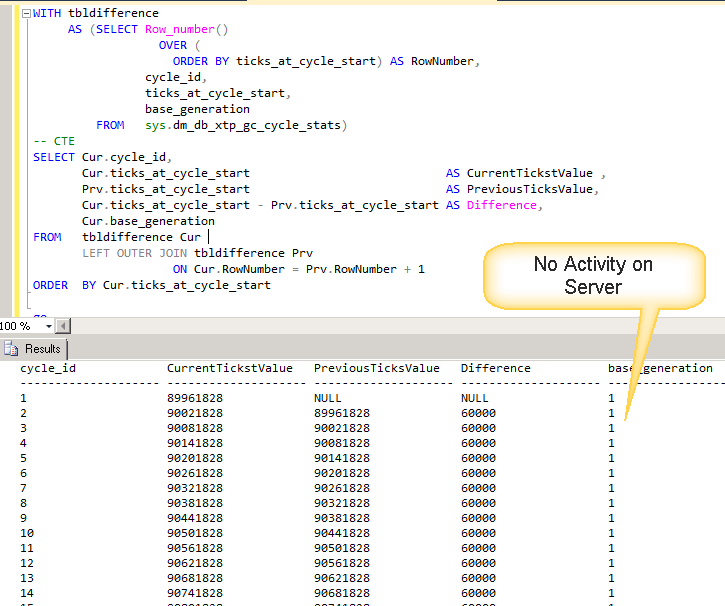 On my machine I only have one default instance and that’s why we see only MSSQLSERVER under “Instance of selected object”. 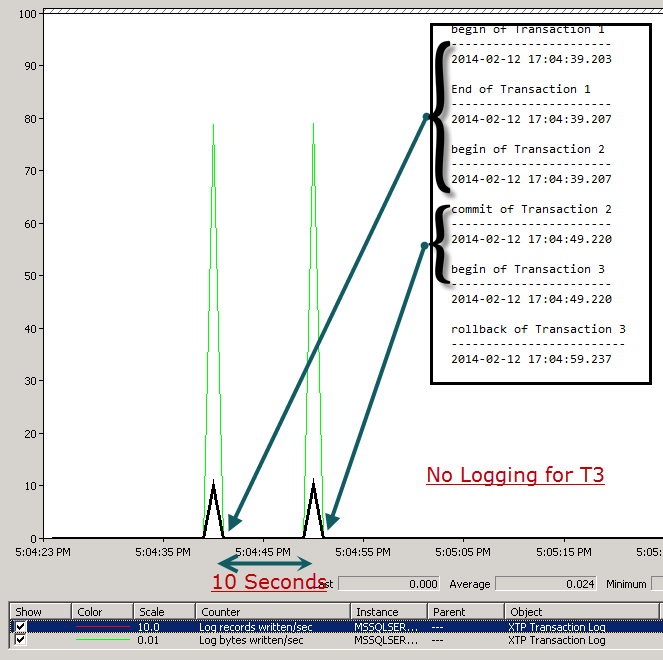 In CTP2, we can see below performance monitor objects. 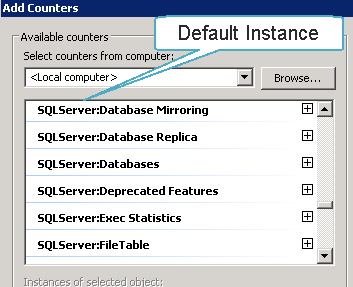 The list of various counters can be achieved using below SQL Server query. The meaning of various counters is available on books online. To demonstrate one of the theory which we learned earlier, we would use “XTP Transaction Log” counter for demo. 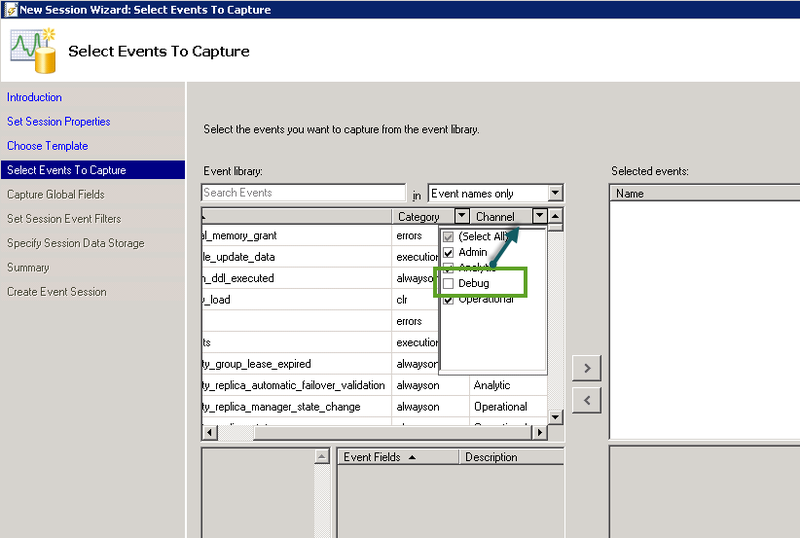 In this blog about transaction logging concepts, we read “Transaction log records are written only if the transaction on in-memory table is committed. This would mean that no UNDO information would be logged“. The number of bytes written to the SQL Server transaction log by the XTP engine (on average), per second. The number of records written to the SQL Server transaction log by the XTP engine (on average), per second. Here is the script which we can run and capture perform at the same time. Here is the output and perfmon data. Here are the conclusion we can make from the graph. Logging is done at commit time of transaction. We introduced 10 second delay in our script and due to that second spike appears. For uncommitted/rollback of transaction nothing is logged in transaction log. Stay tune for learning more on Hekaton / In-Memory OLTP. In the previous blog of A-Z Series, we started learning about garbage collection; we have learned theory about garbage collection of stale rows in SQL Server In-Memory OLTP tables. If you have not read that, I would like you to start from part 1. There are below DMVs available to check the work done by garbage collection system. Before we move any forward, there is another important concept which would help in reading DMV data which is called as “generation”. We can think of generation as queue. 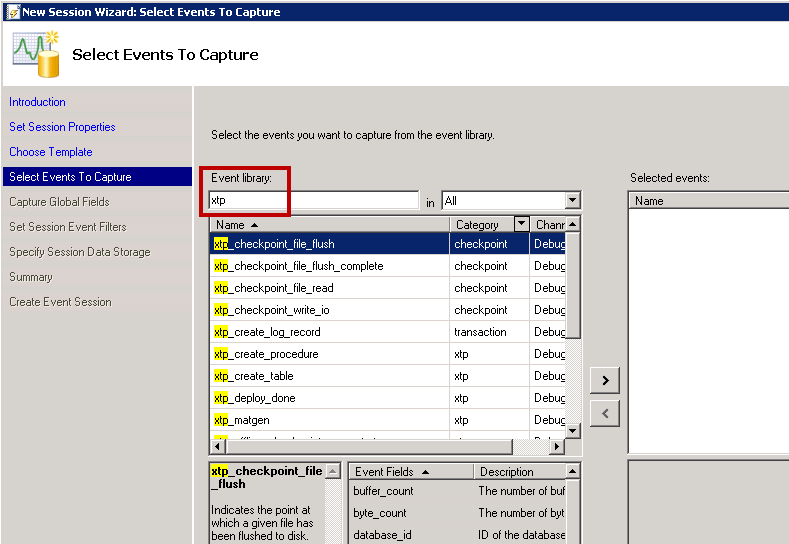 There are 16 queues (generations) available in SQL Server 2014 CTP2. Generation queue holds the transaction which have generated versions. As per Kalen’s whitepaper, this number (16) can be changed later. 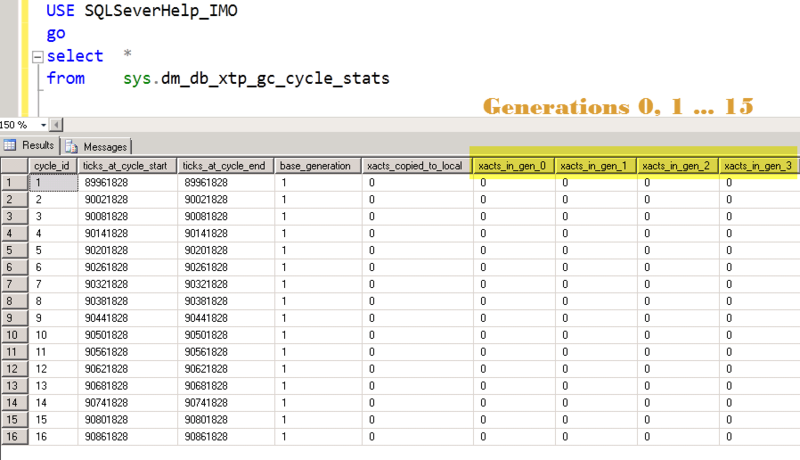 The details of generation queue can be seen by DMV sys.dm_db_xtp_gc_cycle_stats. We would also see another queue which is equal to number of schedulers/cores on the machine. This GC worker queue contains the actual work which is queued by garbage collection process and statistics can be seen by DMV sys.dm_xtp_gc_queue_stats. On periodic basis, the transactions which have generated version is moved to the generation queue. GC threads picks up transaction from generation queues and keep them in GC worker queue. The frequency of checking completed transaction is 1 minute, which can be more aggressive if more transactions are waiting to be processed. Once the work is queued, the user threads can co-operate with main GC thread and clean the garbage which is kept in worker queue. Let’s see this in action. For demo purpose, I have created a wide-column table with around 30K rows. Here is the script which can be used. 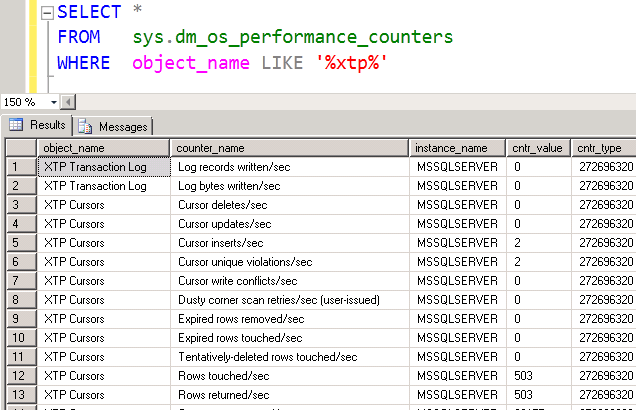 After creating the objects and pumping the data, I have recycled SQL Services to clear the data in DMVs. It’s worth mentioning that this should not be done with production server. 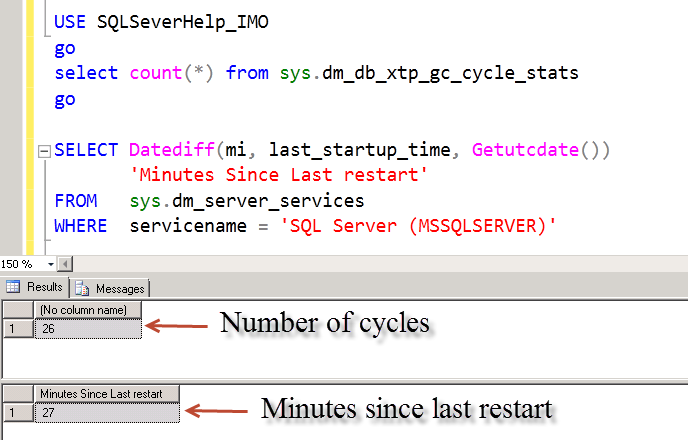 Post restart, I waited for some time so that sys.dm_db_xtp_gc_cycle_stats has some rows. Recall that GC thread starts at approximately 1 min. I have not done any transaction and that’s why “base_generation” stays as 1. We can also see 16 generations as column in each row. Each row corresponds to one cycle when GC has scanned committed transactions. If we try to see the difference between start of two rows, its 60000 ticks which is 60 seconds. I have used CTE in below query to find the same. If we check server startup time in minutes and number of cycles, they would be same. Based on above, its clear that cycle is running every minute. We have not performed any update or delete to generate stale rows so far. Here is the memory used by table. Query available here. Now, let’s generate garbage rows and check the DMVs again. We are going to delete 1000 rows. As we can see above that cycle have become more aggressive (less than 60 seconds) as we did a lot of transaction. Also notice that base generation moves in multiple of 16 (explained earlier) 993-1 = 992 = 62*16. I have to do minimum 16 transactions to increase the base generation. We can see that work was enqueued, got dequeued and current_queue_length is zero. This means there is no garbage data in the queue. Let’s check memory usage of table. This means garbage collection has done it’s work and free’ed up memory used by table as unused memory has increased. We would continue to explore more on garbage collection in next blog as well.